You can flip on a television during an Iowa Hawkeye men’s basketball and see the tallest player on the floor for Iowa diving around on the floor, being a gritty and tough basketball. That man, is Ryan Kriener. Ryan Kriener’s life was made for basketball. Born to parents Nancy and Rich Kriener, both over the heights of six foot four inches, Ryan’s life of basketball was shaped for him. Ryan was born in small town New Hampton, Iowa, where he grew up doing various things, including dancing. Ryan liked to play with his friends and also loved to dance. He never really was in an organized group, just always breaking out into rhythm. If you know Ryan now, you know Ryan is not afraid to dance in any setting. Often in the pregame for Iowa games, he is caught joking around and getting everybody relaxed and loose before the games on the court and in the locker room. Ryan started playing basketball at age three, and his parent’s claimed “he was the biggest three year old ever.” “I want to play basketball for the Iowa Hawkeyes someday,” said little Ryan Kriener to his parents. Attempting to make that dream a reality, Ryan played high school basketball at New Hampton, but after his sophomore season, he decided to get himself more ready for the next level and play at Spirit Lake high school. He would play under a coach who had produced multiple division one basketball players and had won a state championship. In his junior season at Spirit Lake is when Ryan made himself known. Now at a towering six foot and nine inches and averaging 19.8 points per game and 8.5 rebounds per game. Ryan knew he had made the right choice in Spirit Lake when he got his first phone call from a division one program. “TCU was the first to call, and I knew I was on the right track,” said Kriener. “The TCU offer was nice, but I had bigger aspirations. Coach K and Duke could have called, but I definitely would have stuck with Iowa if coach McCaffery and Iowa had offered me at that point.” Iowa did come knocking, later on in the year over the summer between his junior and senior season when he was playing AAU for the Martin Bros at the AAU National Tournament. Kriener and his Martin Bros team went on to play out of their minds and go on to win the AAU National Championship. Little did he know what would happen next. Head coach of the Iowa Hawkeyes Fran McCaffery was watching one of his future players, Cordell Pemsl, who was Ryan’s AAU teammate. At that moment, Ryan’s childhood dream would come true, “Jordan and Ryan, how would you guys like to be Iowa Hawkeyes, because I am offering you both full scholarships.” Ryan remembers not being able to answer the question. Of course he wanted to say yes, but started to go through every memory of basketball in his head. He remembered the long nights shooting in a gym with his parents, the long road trips, the intense workouts at six AM every morning, which all led to the road of walking into Carver-Hawkeye Arena for the first time as an Iowa commit. “I am going to be a Hawkeye,” said Kriener. The struggles he went through to get to this point would continue, but in a different way for Ryan. Ryan put in a lot of work before his sophomore season to feel ready for the Big Ten basketball, but going into his sophomore season, he missed the first few games with a leg injury. But was later sidelined longer with a hard concussion. This gave Ryan a new appreciation for basketball and his ability to play. It’s been a good ride for Ryan at Iowa so far, now in his junior season averaging career highs in all categories, including minutes. Which according to Ryan, is one the most important things for him moving forward. You can catch the Hawkeyes and Ryan on TV frequently. Ryan is now a big reason why the Hawkeyes are ranked number twenty-two in the nation in the latest Associated Press poll, and have aspirations of making it to a Final Four for the first time in the school’s history. This entry was posted in Uncategorized on December 10, 2018 by Hunter. Born April 24th, 1998 Ryan Kriener’s life was made for basketball. Born to parents Nancy and Rich Kriener, both over the heights of six foot four inches, Ryan’s life of basketball was shaped for him. Ryan was born in small town New Hampton, Iowa, where he grew up doing various things. Ryan liked to play with his friends and also liked to dance. Never really being apart of organized group, just always breaking out into rhythm. If you know Ryan now, you know Ryan is not afraid to dance in any setting. Ryan started playing basketball at age three, and his parent’s also claimed “he was the biggest three year old ever.” “I want to play basketball for the Iowa Hawkeyes someday,” said little Ryan Kriener. Jumping forward to high school, Ryan played high school basketball at New Hampton, but after his sophomore season, he decided to get himself more ready for the next level and play at Spirit Lake high school. In his junior season at Spirit Lake is when Ryan made himself known. Averaging 19.8 points per game and 8.5 rebounds per game. Ryan knew he had made the right choice when he got his first phone call from a division one program. “TCU was the first to call, and I knew I was on the right track,” said Kriener. “TCU offer was nice, but I had bigger aspirations. Coach K and Duke could of called, but I definitely would of stuck with Iowa if coach McCaffery and Iowa had offered me at that point.” Iowa did come knocking, later on in the year over the summer between his junior and senior season when he was playing AAU for the Martin Bros at the AAU National Tournament. This entry was posted in Uncategorized on December 3, 2018 by Hunter. “Where Men Win Glory: The Odyssey of Pat Tillman” by Jon Krakauer is a must read. If you don’t know anything about Pat Tillman and his story either, then this is a good place to start. This book covers the life of Pat Tillman from his early life, to football, to joining the army, and his eventual death. Also his death is not a spoiler, if you turn to the back cover and it talks about that right there, so no spoiler was given, so please do not judge this review based on that. This book also covers the topic of the Al Qaeda, 9/11, and the conflict in Afghanistan. This book is also great for a person that is a non-sports fan. Do not shy away from a great read just because you are afraid of the aspect of the sports in the life story of Pat Tillman. How can someone not affiliated or related to the family write a book about the life of Pat Tillman you may ask yourself. Well Krakauer does it, and I think he does it amazingly. If you look near the back of the book on page 296 he breaks down every little detail from the book and where he got that information chapter by chapter. Between hundreds of interviews and hundreds of material reviewed and does it while compiling a great book. The book even dives into the details of his death and how it was reported a different way for public to fuel them and get them more angry about the war and reveals the truth. Krakauer does a really good job at diving into these topics with the war with the Taliban and the propaganda behind it, as he writes it from an angry perspective. Another focus of the book is NFL contract. How Pat Tillman walked away from the future of millions of dollars to continue playing in the NFL and really covers why he decided to go after 9/11 and how that was a huge factor in everything that fueled him to do so. This book focuses on so many different aspects of Pat Tillman’s life, especially the army, but I think he does a great job of covering all so if you didn’t know anything about Pat Tillman coming into this book, then you were able to learn and fall in love with the guy he was and the hero he was. Pat Tillman was truly a great man and I think it is not easy to do in under three hundred pages, but Krakauer does it amazingly. Overall this was a very good book. For most people that know the Pat Tillman story, it is not hard to convince them to read this book. For people that don’t know anything, it is a little harder to convince them to read a book about about a NFL player that walked away to go fight the Taliban in Afghanistan, as non sports fans tend to shy away. I would give this book a nine out of ten. Mostly because I worry a little bit about what is one hundred percent factual in the book as it is hard to talk about a man’s life that is not there to talk about it. And comparing it to my first book review, it is completely written differently then a Paul Shirley book, zero sarcasm was applied. Anybody reading this, please go out and read “Where Men Win Glory: The Odyssey of Pat Tillman.” If you don’t like it (which you will), I would be willing to talk to you on why you don’t think so. This entry was posted in Uncategorized on November 28, 2018 by Hunter. For my profile I have decided to do Ryan Kriener. Ryan is a basketball player at the University of Iowa. For interviews, I will talk to him, some managers, a teammate, and attempt to get an interview with a coach on staff. This entry was posted in Uncategorized on November 26, 2018 by Hunter. At first thought of going around looking for things that make me either happy or sad I thought this was either going to be impossible and I thought I wouldn’t ever find things. That turned out to be far from the truth, as I was able to find things for both. And some things actually do both. Great example is I woke up earlier last week, got showered and ready for class. But when I gotten out of the shower, I had an email from a professor saying that class was canceled. This is met with immediate happiness as I do not have to go to class this day. That is met with immediate questioning of what to do for the next two hours before my next class. This angers me in the slightest as I am ready for the day and some what awake so I know I will struggle. Another thing that makes me happy is time off from school. I went on a trip with the cross country team to nationals and missed three days worth of classes. While gone on this trip I was constantly doing homework and constantly stressed out about when I was going to do my homework because of practice and the activities that we had planned. This is one of those things that make both. Another things that happened this week that made me both happy and sad, but in reverse order was late Monday night. The Kansas City Chiefs were playing the Los Angeles Rams and the game came down to the last play where the Chiefs ended up throwing an interception causing them to lose the game 54-51. This later made me happy as I realized I just witnessed the third highest scoring game in NFL history and the highest scoring by far on Monday Night Football. I also realized how many positives the Chiefs could take away from this game moving forward and I become positive overall about the whole experience. But, he did explain one huge positive of throwing parties. He loves the fact that people leave alcohol at the house, and lots of it and it makes it possible for him to go without having to purchase anything for awhile. It is a secret blessing in disguise. Another situation that seems like a huge negative that turns to a positive in the long run is a track practice. While speaking with a girl she described the pain and agony of running fast and long intervals on the track and how it is one of the things that ruin her whole day while thinking about having to do them and planning her meals around the workout. She did describe the feeling of running that first track meet of the year and knowing that those hard practices led to the success she had right out of the gate during track season. She looks back and is extremely grateful for the pain she went through during the hard interval days. It’s the little things in life that make us happy or sad, but they are simply the things that can get us through a day if we keep an open mind about the whole things. Optimism is described as one of the biggest things needed in a positive lifestyle. A positive lifestyle turns into a positive outlook of life. This entry was posted in Uncategorized on November 20, 2018 by Hunter. For those that know me, you would think that sports would dominate my America, and you would be right. This picture is my typical Sunday, I wake up late, just in time to watch the football games. Notice the orange juice, since I am typically just rolling out of bed. 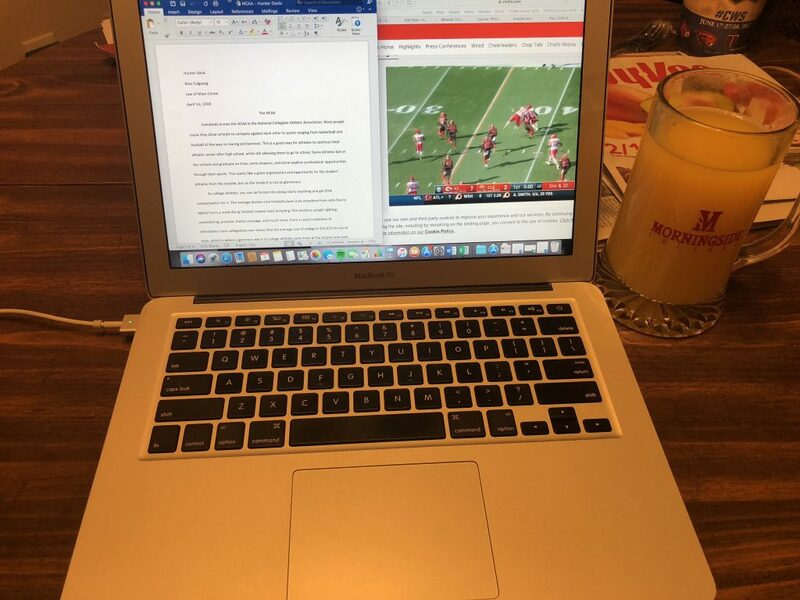 I am watching the Kansas Chiefs game while typing a paper. This normally doesn’t go well for me as I end up mostly watching the game and typically only typing a page or two in the three length of the football game. The next picture is post election when people were looking at results, but this is a perfect representation of my life. As my roommate is also watching football and clearly paying more attention to the football game. This accurately represents “My America” because clearly politics and the results are important, but not as important as football and betting on football to me. 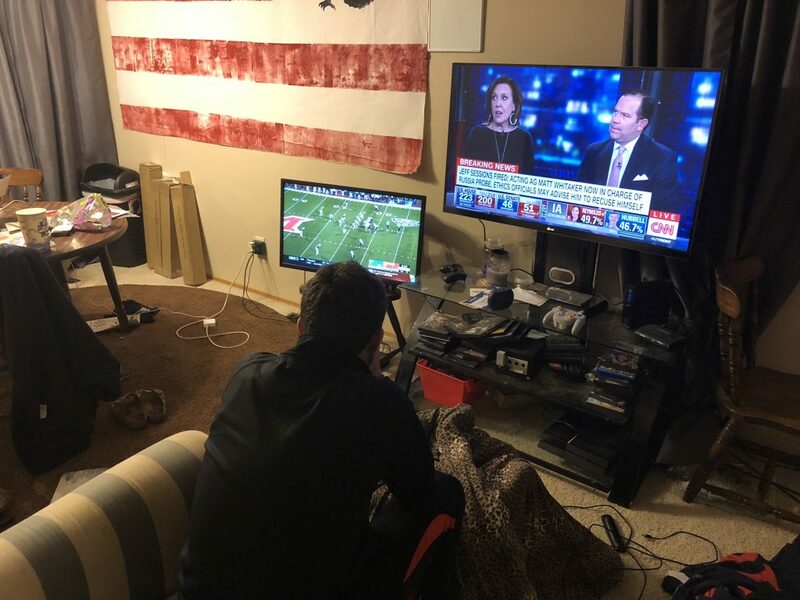 Even my roommate Anthony who is a political science major was caught paying more attention to the football then the results. This next picture accurately represents how I get through most weeks and days. Coffee and Red Bull keep me awake in classes and give me energy at practice. And the frozen pizza shows how I fuel myself on a budget. I often cook frozen pizzas because they are cheap and delicious. The other things more college I could of added to this picture would of been ramen noodles. 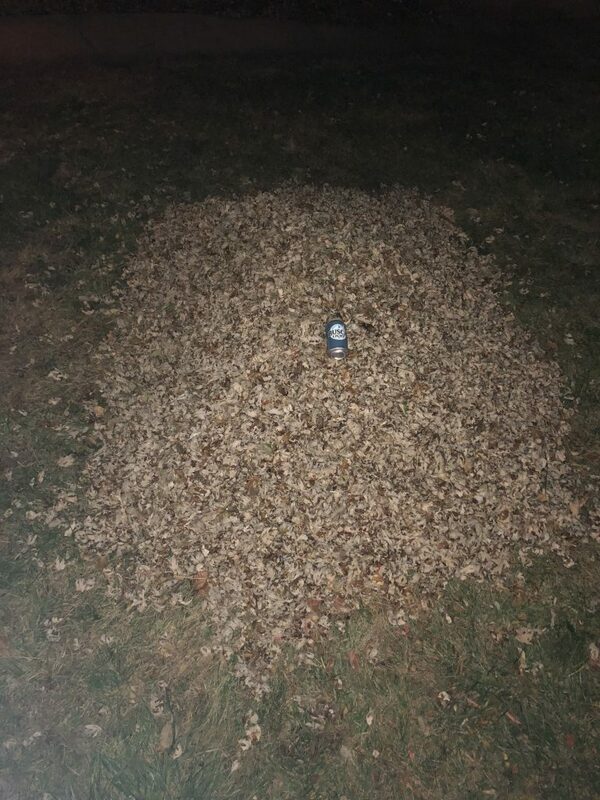 This next picture is a picture of a pile of leaves I raked with a Busch Light appropriately found when raking. Busch Light represents cheap beer and another aspect of my life and where I live. Busch Light is a very popular beer among Iowa college students and it is often left around the street and yards from people littering a lot. Another theme among these pictures is laziness. All the pictures are taking within a very close proximity of my house. 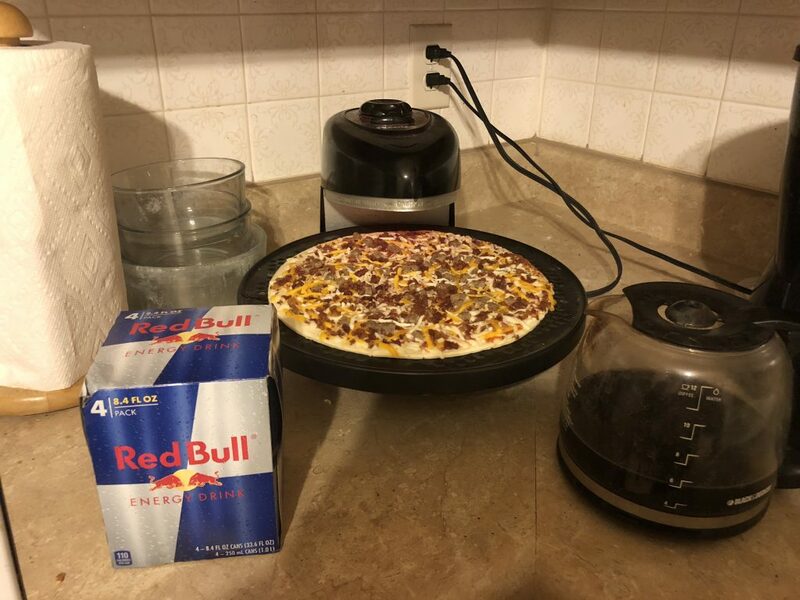 Laziness is another theme within my life and a lot of “My America.” And these are the picture that I believe accurately represent “My America” very well. This entry was posted in Uncategorized on November 7, 2018 by Hunter. “If you had to pick one thing to describe Morningside College’s culture what we it be?” I asked multiple people this question, and got a similar answer out of the people I asked. Tony Patton was the one of the first ones to fire a response to this question with such excitement. He exclaimed “Football, of course.” This answer seemed to be similar among a lot of students I asked. “Sports” was even a reoccurring answer throughout campus. Football, it is an exciting sport that has lots of big hits and big plays which leads to some exciting games and moments through the year. But diving into the question even more, what draws most students into the football games. And the answer isn’t the game as much as you they lead on with their responses. It’s the culture outside of the game. Before, after, and even during. The social aspect of hanging outside in the cold or heat to grill food and drink alcoholic beverages is an attraction within itself, and you get to follow that up with a football game of screaming and for most college students, more alcoholic beverages. Which could almost be a culture of college within itself as well, but that is a discussion for another time. So what is the attraction to waking up early to be inebriated from alcohol. The music and people always help. Tailgating and getting ready for a football game is something special most describe. Planning out everything the night before, between a grill, the food, the drinks, the music, and the game is something that is thought out very deeply. Nothing can be forgotten. So I decided to see what the big deal was about tailgating. As a sports broadcaster, I look forward to the actual game, this week I was setting my alarm early to early enough to experience tailgating first hand at the Morningside for the football game against Dordt College on Saturday, November 3rd. While walking around the parking lot of Elwood-Olsen Stadium, I realized two things about the tailgaters, these people are die hard fans and they are extremely nice. They kept offering food after food as I made my rounds throughout. I made my way throughout many tents and asked people questions. Most did not want their names revealed in the papers and some even refused to tell them, even though they were wearing customized Morningside jersey’s with their son’s names on the back. Another quick realization I made while walking group to group was that they are mostly families. Most groups consisted of families and maybe families friends in some cases, but not as many students and alumni as you would expect. Looking at people that go tailgate at division one colleges, it seems to be all drunk students and alumni. At Morningside, it is not drunk students and alumni, it is purely adults have alcoholic beverages at a respectable pace to not get drunk, but to have fun with the people they are with. Most offered me beers as well, so you could tell none of their jobs were police officers, because they never asked for my I.D. “We go everywhere,” said one mother. “If it’s an away game and we don’t think we can make it in time to get there over three hours in advance, we will go down the night before and book some hotels with other parents.” She later described that this sometimes turns into a two-day event due to that. “Football season is flies by in a blink of an eye,” said one fairly intoxicated father. “We don’t miss any games because before you know it, their four years are done. This is our second kid to go through the program so the second time around we learned to live it up a little more.” The father of two also made a joke about his son red-shirting one season so they get another year to come. Making my way towards the stadium near game time I decided to look back at the tents and groups. Most had made their way in and some have decided to pull out lawn chairs and watch from a distance in the parking lot. So I went and asked them why they drive here, just to sit in the parking lot. “I like football and I like beer. If I sit out here I can do two of my favorite things,” said a tipsy father. In theory that makes sense, and technically it doesn’t matter where you sit, you’ll see the same game. So I made my way into the stadium to watch the game finally after the long, but mostly fun day of tailgating. So no matter where you go to college, football is a big deal, but the tailgating scene is a little different throughout the ranks of colleges and is unique in it’s own way. This entry was posted in Uncategorized on October 31, 2018 by Hunter. This picture to me represents Morningside College because of the Beaty of the photo and what is it in. It shows the two modern looking building in Buhler Rohlfs and the library. 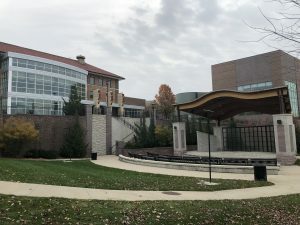 It also shows the outdoor theater which represents the liberal arts side of the college. Honorable mention is the small class sizes because I think that is a huge benefit of attending Morningside College. This entry was posted in Uncategorized on October 30, 2018 by Hunter. “Can I Keep My Jersey” is a book written in first person about the life of Paul Shirley through the voice both serious and sarcastic by Paul Shirley himself. This book is perfect for the everyday sports fan or somebody interested in sports, or about the life of somebody on the edge of greatness. Shirley was a former walk-on at Iowa State turned in a three year starter shortly after his time began in Ames. Shirley being a white, six foot ten inch basketball player never thought he was good enough to play in the NBA. But something one of his high school teacher said to him, stuck with him for a very long time and motivated him to get into the NBA someday. Yes that is a spoiler for the book, but Shirley spoils that himself early on in the book as well as with the cover picture of the book. Though, he never makes it with his original team out of college, the former world champion Los Angeles Lakers. Players on that team included Shaquille O’Neal and Kobe Bryant. In this hilarious first person book, Shirley describe the ups and downs of not quite being good enough to make an NBA team permanently. He is often star struck as well as who some of his teammates become for the short times that he is in training camps in the preseason with teams. Even if you don’t like sports, this book is a great read just because of Paul himself. You can tell he is not an author, but the way he writes this book about himself is unique because he is negative about himself and never sees himself making it into the NBA, or just the sarcasm he has throughout the book, between teammates and even girls. Shirley often talks about the struggles on what he thought to do and some of the struggles even of playing overseas. Whether it be the food, the language barrier, or him just straight up getting cut out of a money he deserved and signed a contract for. He talks about the dilemma of being better then the players that get signed by these big NBA franchises in front of him because he was undrafted and the teams used draft stock on the worse players, so they show the loyalty to that player. He talks about the dilemmas in choosing a place to play, whether that be near his hometown in Kansas for a lot less money, or whether that be in a more meaningful league overseas again where he will make more money. The life of Paul Shirley is definitely an interesting one between the ups and the downs and him describing it himself, adds a whole new element to this great book. Overall I would definitely recommend it to all sports fans and anybody interested or thinking about going to play a sport professionally after high school or college. Overall I give this book 4.5 stars out of five. I think this is one of the my favorite books I have ever read, and definitely my favorite I have read since high school. While Google-ing Shirley I have looked into his other book and into his blogs as well for future reading. Definitely worth it, you won’t be able to put the book down once you start it. Very good and funny from start to finish. This entry was posted in Uncategorized on October 15, 2018 by Hunter. Saturday September 29th marked a first for me. I traveled to Hastings, Nebraska with Steve Bates and Daniel Ver Steeg to broadcast a football game between he Morningside Mustangs and the Hastings Broncos. I’ve done ton of games before, but none like this. Earlier in the week I had been asked by my boss, Curtis Anderson, if I wanted to go to the game and be the sideline reporter for the game. I had originally declined and thought to myself, that it won’t hurt me to try something new. So I called Curtis and said I would do it after my original hesitance. I’ve only ever done play-by-play and color commentary for broadcast. Today I was trying something new. I was playing the role of the sideline reporter. It is something I’ve often wanted to try, but didn’t think I would be any good at it. As a sideline reporter you must be nosey and try to figure things out about the game plan and about injuries and other various task. You must also be able to interview the head coaches very well before and after the game. Also something, I’ve never been good at. The whole way down, I prepped in my head about what I was going to say in the pregame interview and it definitely didn’t help. My pregame interview with Mustang’s head football coach Steve Ryan didn’t go well. “Well that was quick,” is what Bates said to me when I got back. It was a very short and brief interview. And I knew that would affect the pregame, since it was so short they wouldn’t be able to get a break before the game starts. Something I had worried about on the drive down. This stuck with me throughout the beginning of the game and made me panic with a lot of what I did throughout the game. I tried to come back in the second half, by finally doing something positive for the broadcast and finding out about the injury status of Mustang star defensive lineman, Dominick Barrett for them. Coming out of the half I was able to give a great recap about the injury status of Barrett. It gave me confidence that made me soar throughout the second half, which even lead to the guys sending it down to me more often in the blowout game that was moving very slowly. This momentum carried me into the post game interview with coach Ryan. The interview went so well for myself, that I texted the board operator back at the studio and asked him to re-record it and save it, so I could use it for future job interviews. I left the stadium with extreme confidence about doing sideline reporter and just for future endeavors as well. “You did great today on the radio,” said head cross country coach at Morningside Dave Nash to me, who was tuning in to hear a halftime interview with himself that was prerecorded. Overall I’m glad I did this experience and I felt like it toughened me up and taught me a lot about what I could possibly be doing a lot of in my future. I love doing play-by-play and color commentary, but it was nice to expand my horizons and do something new and fun for once. 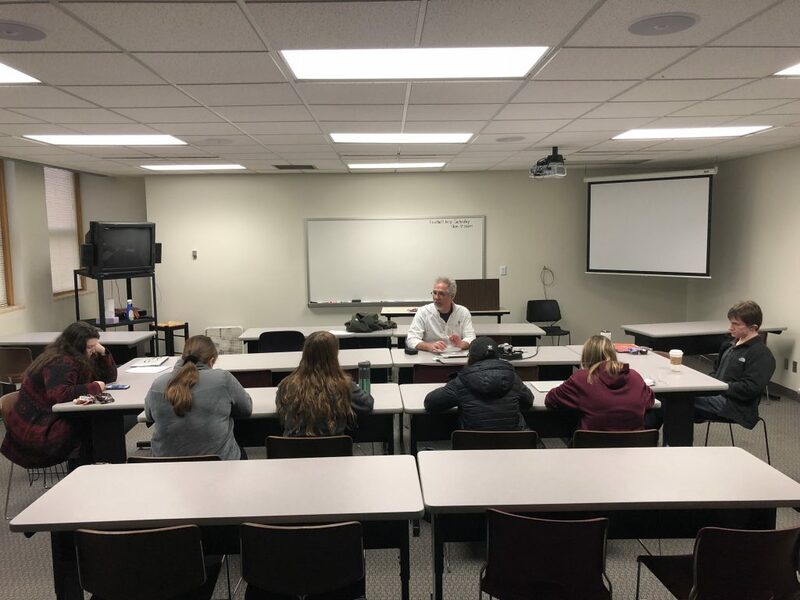 “Trying something new or out of ordinary can be scary,” said 7th year Morningside student Drew Schiltz and hesitantly made the decision to pursue a new degree in education after being unhappy with his old one in business. Drew is a great example of stepping outside of his confront zone and doing something that was scary to him and something that very few people supported initially. There are three universal truths to this story. Don’t ever be afraid to try something new. And don’t afraid to be nervous, because it means you care. And if at first you don’t succeed, don’t give up, try again. This entry was posted in Uncategorized on October 8, 2018 by Hunter.